I love Christmas music; I listen to it year round. Even in January, when most people are sick and tired of hearing Christmas music, I have it turned up, in my living room, and sing at the top of my lungs. A few years ago, I requested Joy: An Irish Christmas as a gift (and received it from my MIL)! 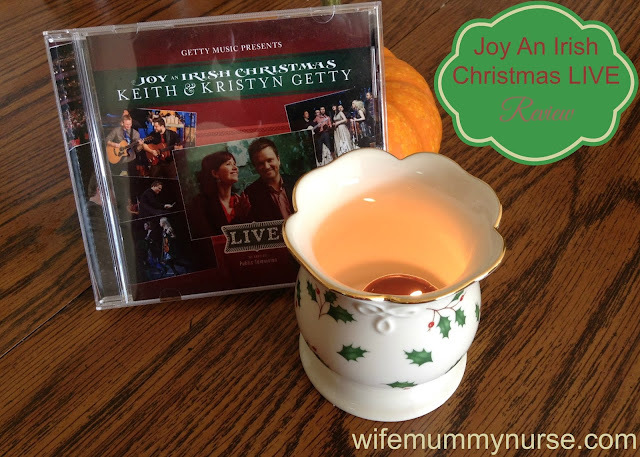 When I saw Keith and Kristyn Getty were coming out with Joy: An Irish Christmas (Live), I wondered, "Would I like it? I already have "Joy: An Irish Christmas". Would I like the live version?" The answer to the question is hands down, "Yes! Even if you have the first Joy: An Irish Christmas, the live version is different and even better." Join modern hymn writers Keith and Kristyn Getty for this one-night, live recording from their annual Joy: An Irish Christmas tour. This album showcases fresh and extended arrangements of popular Christmas songs, as well as eight new carols that tell the Christmas story like none other. "A Mother's Prayer" by Keith & Kristyn Getty and Fionan de Barran: The first time I heard this song was at a concert of the Gettys at Grove City College. It was written after the birth of Eliza (the Getty's daughter). This is a song is one that other mums would gravitate towards. It can be sung for any stage of life (infancy through your child's adult years). It helps me remember that my children are in God's care, and there's no safer place to be. Take His hand and go where He calls you to, and whatever comes seek Him with all your heard. This will be my prayer for you. "In Christ Alone" by Keith Getty and Stuart Townsend: I first heard this song over 8 years ago, during a very heard time in my life. My life did not turn out as I had planned. I was lonely and going through various trials. In Christ Alone helps me to remember that my hope is in Christ. It's not in having a husband, children, a bigger house or apartment. The things I listed will not make me a better Christian. It is because of Christ's strength and power that I'm able to stand. If you are looking for a solid Christmas CD (without fluff) or love music with an Irish flare, go buy "Joy: An Irish Christmas (Live)." I was given a copy of Joy: An Irish Christmas (Live) for the purpose two review. I was not compensated in any way, and all opinions are my own. Lovely review--this is my kind of music--I'll be looking into it :-) . This sounds nice! Hubby loves Irish music - I think he would enjoy this! How fun! I just love Christmas music! I love both Christmas music and music from Ireland! Sounds like a great CD! I love Christmas music! This CD sounds amazing! I'll have to check it out and add it to my collection. I love Christmas music. I have never listened to Irish music, so I don't know if I like it, but the lyrics sound moving and very deep, which is always special for me. I love songs that turn my life into worship! I love the Gettys, their music is great! I need to take a look at this one! Thanks for sharing about this CD. :) The track list sounds interesting with some Christmas Carol Favorites there! I love Christmas music. I'll look out for this. I have never heard of this band before. My wife loves Irish music and we all love Christmas music so definitely want to check it out. Thanks for the great review! I love Irish music and I love Christmas music, so I will definitely look into this. Thanks for sharing! Yay!!! I love Christmas and Christmas music is my favorite!!!! Thank you for this nice review. I think I would like this. Nothing is cooler than live music! There's something magical about Christmas music. I'd like to listen to this Christmas music CD that has an Irish flare. I bet this is a good CD. I love Christmas music! Oh, this sounds like a wonderful CD! The Europeans love the old classics!